Black Mountain Pink: Large vines grow to 5 foot tall producing 1 1/2 to 2 pound sweet pink beefsteak type fruit. Originally found on an abandoned homestead in Harlan County, Kentucky in 1933. Grant County Pink: Healthy vigorous plants with potato leaves grow to 5 feet tall producing 4" to 6" pink beefsteak tomatoes with a balance of sweet and tang flavors. We collected this from an elderly market grower in Grant County Kentucky. Locally also known as Miss Sue's. Pike County Ohio Pink: This pink beefsteak came from an Amish family in the Beaver area of Pike County, Ohio. Wonderful flavored, heavy fruit set, potato leaf plants. 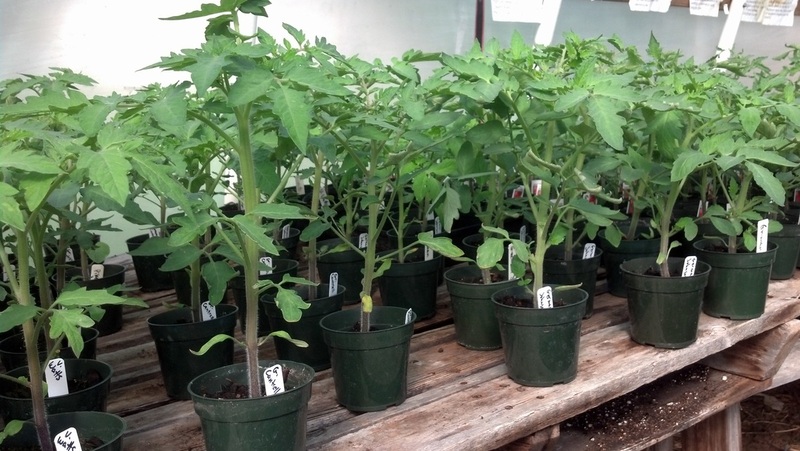 Vinson Watts: Vinson received this seed while working at Berea College in Kentucky and continued to improve this tomato for over 50 years selecting for good production, flavor and disease resistance. Large pink beefsteak fruit with a balanced flavor. Vinson passed away in 2008. Granny Cantrell's: Productive vines yield 12 to 18 ounce pink-red fruit with a good flavor. Heirloom from Lettie Cantrell of West Liberty, Morgan County Kentucky. Lettie received the seeds from a soldier returning from Germany during World War II. Lettie grew this tomato since the '40s, it was the only tomato she ever grew. Lettie always called it "her German Tomato". Lettie passed away in 2006 at the age of 96. Barnes Mountain Pink: Tall vines produce 10 to 16 ounce reddish-pink fruit. Good producer. From Barnes Mountain in Estill County Kentucky. Livingston's Giant Oxheart: Introduced in 1926, an old Ohio variety, large meaty fruit with few seeds. Aunt Ruby's German Green: Good yield of green-when-ripe 8 to 12 ounce beefsteak tomatoes. Ripe fruit will have a slight yellow cast over the green with a blush on the bottom. Nice spicy flavor. Heirloom from Ruby Arnold of Greenville Tennessee who passed away in 1997. Old Virginia: Large vines produce 8 to 10 ounce smooth red fruit. An heirloom from the Giltner family of southern Virginia since the 1940's. Red Brandywine: This is the original red strain of Brandywine from Chester County Pennsylvania dating back to 1885. Expect high yields of 8 ounce smooth red fruit with a good flavor, smooth and crack resistant, excellent for market growing. Beauty: An old Ohio variety dating from 1886. Strong grower producing 6 to 8 ounce pink fruit. Great as a canner, fresh use or for market growing. Buckeye State: Heavy producer of 4 to 8 ounce pink fruit. Dating to 1893, an Ohio heirloom grown for generations. Main Crop Pink: Pink fruit from 8 to 12 ounces, heavy producer, excellent for canning or market growing, dating to 1941. Aunt Lou's Underground Railroad: this was carried by a black man as he traveled on the Underground Railroad from Kentucky and arrived in Ripley, Ohio, where he crossed the river to freedom to a well-known stop on the Underground Railroad named the Rankin House. He grew these tomatoes there, and later shared seeds with a woman named Lou, who later shared seeds with her great nephew Francis Parker. Years later Francis of Sardinia, Ohio, shared seeds with Wilfred Ellis, owner of Ellis’ Feed Mill and these eventually went on to Susan Barber and then to Gary Millwood. Francis dies in 2009. Fruits are dark pink and range from 4 to 12 ounces with a more acidic flavor. Cherokee Purple: Large vines produce dusky purple-pink beefsteak type tomatoes with a green shoulder when ripe. This tomato has a unique complex flavor with a balance of sweet and smokey traits. Sevierville Tennessee heirloom dating to before 1890. Yellow Brandywine, Platfoot Strain: Large indeterminate, potato leaf plant with large golden beefsteak type fruit, up to 1 lb, excellent flavor, worth waiting for. Hillbilly: Productive potato leaf plants with yellow-red bi-color beefsteak fruit that are flavorful and sweet, almost fruity. Heirloom from West Virginia. Always a favorite. Virginia Sweets: This heirloom variety is one of the best tasting, best producing yellow-red bi-colors we have. Large one to two pound sweet fruit. Herb's Sunburst: very large sweet bi-color fruit originally from the Abbott family of the Blue Creek area of Adams County, Ohio.